Do you work at Kateh? What did you think of Kateh? Absolutely shocked with the attitude of the waiter who called herself manager, poor quality food and service from middle east restaurant in my lifetime. Things have changed for the worse in this awful place. A dozd bazaar as is said in Persian. Unless you have never tasted genuine Persian food before, this restaurant may appear to you as “Persian”. The food was low in quantity, high in price, and the quality was nothing to shout about, unless as I said you are a novice to Persian cooking. But two of the most awful features of this place were its incredibly tight ambiance and worse than that its unfriendly and rude staff. The head waiteress could not speak English properly and the Italian head waiter was surly. Also watch out for being over-charged! If they can get away with it, they will. Never will go there again and will discourage others to go there as well. Thank you for you honest review of this awful place. Brilliant and accurate description of this awful place. Thanks for being honest. The staff are hugely rude and uncaring and the food is nothing to shout about unless you have not tasted a proper Pesian meal before. Not to be recommended at all. Having booked a table a week earlier my friend and I were really looking forward to enjoying a tasty meal as some reviews suggested! When I told the waiter that the glass of wine brought to me was a little small (125ml) and I would've preferred a larger one and he replied that he could not read my mind, I immediately got worried. Two minutes later an older Iranian woman who seemed to be the owner came to our table to urge us to order as we only had the table for 1.5 hours! We weren't told this when we reserved so when we told her this she cameback to tell us that actually we only had the table for one hour! Upset we asked for the wine bill and told her that we wanted to leave as 1 hour is not enough time to enjoy dinner with a friend I hadn't seen in a while. She couldn't have cared less. The bill was sent immediately and she didn't even bother looking at us once. VERY RUDE. Just as we were leaving though the couple next to us were being served a meat kebab with just some plain rice not really my idea of a delicious meal so maybe that was a blessing in disguise! My favourite Persian restaurant in London and probably one of the best. Great location, great food and great ambience. Their menu is slightly different from typical Persian cuisines. They have some authentic foods which you don’t get them even in Tehran! The food is a bit pricey but I personally think it’s worth it. Went to this lovely restaurant last night, my date and I absolutely loved it!! We were greeted by warm welcome of the owner into a warm quaint dinning area, even though I had read it was small i was still a little surprised. That quality made it even a better evening... The waiters were prompt and polite explaining what was being served at every course, wine was kept on chill and topped up every time our glass look near empty. It quickly became busy and filled with happy dinners enjoying great food, a group who I'm guessing had not made reservation turned up but instead of the usual abrupt " it's a long wait" excuse they were offered warm Turkish tea as they waited in the warm spring night.. Now that's service. Our food was cooked to perfection and went down a treat, I had the cod, and date had the tuna, our whole meal including bottle of wine came to an affordable £52 not a penny unhappy to spend. Never felt rushed or unattended to, a really lovely place we'll surely visit again! Big thumbs up!! 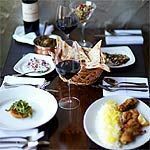 Little Venice is home to a new Persian restaurant called Kateh. The location may be a bit remote, but people are making the journey. With food that encompasses a modern, healthier approach to cooking with time honoured traditional recipes, it won't be long before they are queueing at the door for this somewhat hidden gem. Kateh's understated elegance provides a pleasant change from the designed-to-impress interiors of most London restaurants. That's not to imply that it's not impressive, for it's actually quite beautiful, but Kateh's elegance stems from its simple design, minimal adornments and the building's inherent beauty. With some skilful modifications they have managed to take the walls from Artex to artful, even managing to make the wall of verdigris tinted silver paint look quite refined. The ceilings are painted in a deep brown, but somehow they add a warmth to the room and the chandeliers of multicoloured glass help to dress it up without drifting into gaudy. Dark wood floors, reclaimed tabletops with classic settings, a leather banquette and a lovely glass partition complete the scene, which, oddly enough, pulls together quite nicely. 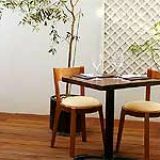 In addition to the main dining room, there's also a beautiful al fresco patio, with seating for up to twenty five people, and a room on the lower level that can accommodate a private party of ten. Arrive at Kateh before seven at night and its empty dining room may have you pitying owner, Narges Pourkhoumami. But, grab a seat while you can, because within an hour's time almost every one of Kateh's thirty four seats will, most likely, be filled. In the three short weeks it's been open, this restaurant has made quite a name for itself, and the customers are returning regularly, bringing their friends and family with them. This is a bit of a double-edged sword, as the warm and endearing staff are bolstered by the public's reaction, but a bit overwhelmed by it as well. 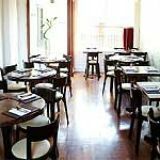 Indeed the restaurant can easily turn from charming little hideaway, to buzzing hot spot in virtually seconds. At this point, the scant staff has to struggle to keep up. The service shifts from attentive to less than, and although food arrives promptly, things like dish clearing and beverage service take a hit. It would be wise to keep this in mind when planning a visit, and take advantage of the early-week lull if you're looking for a more intimate experience. The meal begins with an offering of a traditional Persian libation called sharbat-e sekanjabin, which combines a tangy, sweet syrup made from honey and vinegar, with shredded cucumber, spring water and mint to form a truly delightful and healthful drink. Starters average around £3.50, but the two stand-outs come in at the top of the price range (£9). Salad laboo features Burrata, a creamy, soft, lightly salty cheese (its flavour is subtle, its texture divine) topped with roasted beetroot, fresh basil, lemon juice and olive oil. This is a perfect combination of flavours and textures, one that lends itself to thoughts a warm summer night on the patio, but tastes just as delicious in the dining room, so why wait? Koofteh berenjii is another gem from the kitchen. These Persian meatballs, made from beef mince, are covered with a robust sauce and served over plums. The resulting combination of sweet and savoury flavours will have you mopping your plate with bread in order to get every last morsel. As you move onto your mains you'll already have an appreciation for the kitchen's passion for food. They understand the concept of balanced seasoning, and consider grilling to be an art form. The Sultani grill embodies both concepts, providing a skewer of marinated lamb fillet and a skewer of seasoned veal mince served with saffron rice. Each skewer brings its own unique gifts to the dish, but both arrive at the table perfectly cooked, juicy and full of flavour. At £15 it's actually a bargain, as it combines the main component of two other grills on one plate, giving you a chance to enjoy more of the kitchen's magic for less money. The ghelieh mahi (£16.00) is described as a Southern Iranian cod stew, which doesn't really do it justice. It's a wonderfully seasoned cod fillet, seared and served over long grained basmati rice with a hearty sauce of tomato, tamarind and fresh herbs. The tamarind and coriander flavours battle to take primacy within the sauce, but the fish and rice round out those flavours nicely, resulting and another winning combination. The home made desserts are another triumph, and delicious. Koolouche roodbar (£5) is a simple creation made from Persian date/walnut cookies, and cinnamon ice cream. The ice cream is superb and acts as a perfect conduit to allow the sweet cinnamon flavour to mingle with the light delicious biscuits. The strudel filled with Bukhara plums is light, soft and buttery. Served with vanilla ice cream, it is simply excellent. The drink menu is a bit limited, with wine choices that are too similar in characteristics to offer much of a sense of variety. The good news is that the food favours are so well balanced that they can handle any wine you choose. So, though your choices are few, at least they pair well with the food. The Turkish coffee is a bit of a disappointment. Although it has a wonderful flavour, the staff just haven't mastered the pour, and so, you are likely to get more coffee grounds then you should, which could render the cup undrinkable. Thankfully, there are teas, espressos and the like on offer too. Still in its infancy, Kateh has everything working in its favour. Great food, a dedicated (if not overworked) staff, and a pleasing atmosphere both inside and out. 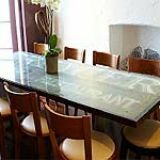 Prices are very reasonable for food of this quality, and although the location is a bit remote, it is definitely a restaurant worth making the trip for.